Explore a unique, subtle, exploratory and dynamic approach to yoga, breathwork and the inner stillness of meditation with Patricia and Surya, who bring over 35 years of experience to their teaching. Be inspired to open beyond your normal reference points to awaken to an expanded, enlivened, renewed and attuned sense of Self. Awaken each day in a room perched right over the sea, the jungle behind you, imbued with the air of the sacred. Practice in a light-filled, spacious, ocean air filled space and sleep each night listening to the waves, revitalized, renewed, relaxed and re-connected to yourself and to what truly matters in your life. Each day there will be three sessions. The focus of our sessions is to open energy pathways, quiet the mind and to remember and experience the stillness and ease of our True Nature, the timelessness of Pure Consciousness. Yoga sessions invite the cultivation of deep listening, and fluid unwinding, while awakening sensation as guide back to body’s innate intelligence. This approach to practice, shifts the habit of doing asana to an unfolding, by feeling and sensing our way thru the practice. Sessions will be guided with periods for self exploration and discovery. Meditation and self inquiry sessions will focus on becoming familiar with the rest and ease of our essential nature in the midst of all activity. The meditation sessions offer mindfulness and breath awareness based on Vipassana meditation as well as non-dual, open awareness meditation and self inquiry. Breathwork is one of the quickest ways to personal transformation, enhanced wellbeing and the direct experience of expanded consciousness. It is a profound dimension of our retreats. Yelapa is a small fishing village with no roads, surrounded by high, lush mountains and jungle, therefore no cars. It is like stepping back in time. Transportation on the narrow paths is by horse and donkey. The only access to the village is by a 40-minute boat ride from Puerto Vallarta. Nature is ever-present at Pura Vida, with giant whales occasionally emerging from the sea directly in front and over 350 species of birds in the jungle behind. 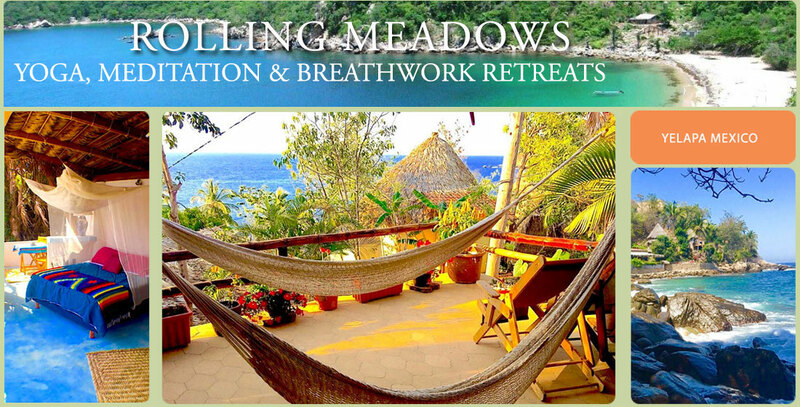 Pura Vida is a newly opened retreat center situated at the far south end of the small bay that is Yelapa. The only access to the center is by a narrow path that winds along the edge of the sea, about 15 minutes walk from the small village, affording a beautifully remote and tranquil retreat environment. The rooms are spectacular – open the prana filled air and overlooking the sea, each with a private bathroom and hot showers. The dining area is open to the surrounding environment with views of the sea on one side and jungle on the other. A link to the Pura Vida Wellness Center is here. March is normally dry season so we can expect each day to be sun-filled. Please Note: This retreat is not suitable for people with walking limitations due to a number of steep stairs and uneven walkways. The fee includes all meals at the center, the three daily sessions, lodging and transportation by boat Sunday morning from Puerta Vallarta and the return Saturday morning. Click here to see a photo gallery of Yelapa and the retreat center. First please contact us to determine if space is available. A $500 deposit will secure your place in the retreat. To register click here. Indicate that you are registering for the Mexico retreat and your choice of accommodation. The balance is due December 15, 2019. Payments are non-refundable and non-transferable. A “frequently asked questions” page with various details about the retreat may be found by clicking here. A link to Pura Vida Wellness Retreat is here. To read more about the style of teaching click here and here. I recently attended a kirtan and yoga retreat at the Pura Vida retreat center. I kept hearing from many of the guests that it exceeded all their expectations. It certainly did for me. The food was amazing. The beds were organic and super comfortable. All the rooms seem to be fantastic. All the guests in my group seemed to think they had the best room. I’ve stayed elsewhere in Yelapa several times over the last few years.. I will continue to come back to Pura Vida in the years ahead. My only complaint.. I had to leave..
Let me start by saying I am a flight attendant, so I travel a ton and typically look for unique places to visit when I have time off. 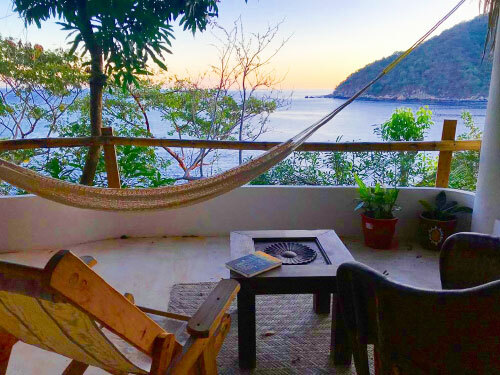 Yelapa is a magical place in its own right, but staying at Pura Vida was a great decision. The open-air rooms overlooking the water was/is something unmatched anywhere else I’ve traveled to. The food was amazing and I’m not normally a vegetarian, nor have I desired to be. I loved every meal I had over my 6-day stay and the staff was very generous always catering to my elixir and smoothie requests, which were top notch. WOW – Feeling super blessed and empowered from recently completing a course at Pura Vida as well as spending an entire month here. I feel fortunate to have had the opportunity to break away from the city life to experience such tranquility in paradise! Where to begin – Pura Vida is located right on the ocean with the jungle just behind you.. To hear the ocean waves so consistently is so soothing to the soul. The rooms are gorgeous, food is freas, healthy and delicious! All prepared by a few local sweetheart sisters that never disappoint. Every meal has been comforting and uplifting! Pura Vida, aptly named, is pure paradise! The open-air palapas make you feel like you’re living outdoors, but you still have access to a real bed, running water, and electricity. The scenery is amazing, the staff are wonderful, and the food is delicious. I will definitely be going back, and I hope to stay much longer next time! One of my favorite things was the town of Yelapa and how it felt like I had traveled back in time. The people there are wonderful, and the snorkeling was much better than I expected, right from the beach!